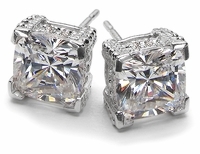 Diamond Quality Cubic Zirconia Stud Earrings! 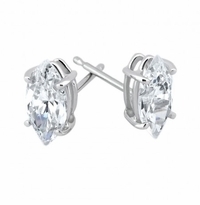 Our Diamond Quality Cubic Zirconia Stud Earring collection features the finest Russian formula hand cut and hand polished laboratory grown cubic zirconia available. 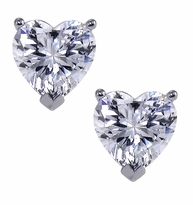 We feel that cubic zirconia stud earrings are the foremost accessory that must be in every woman's jewelry collection. 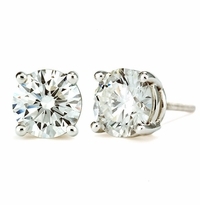 Ziamond's lab created diamond simulant Cubic Zirconia earring studs add that "must have" sparkle to your face, making anyone who wears them feel confident and radiant. 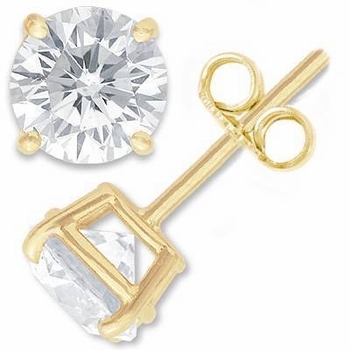 Our high quality cubic zirconia stud earrings are available in many different shapes and carat sizes basket set in solid 14k yellow gold, 14k white gold, 14k rose gold, 18k yellow gold, 18k white gold and luxurious Platinum. Choose from round stud earrings, elongated cushion cut stud earrings, princess cut stud earrings, asscher cut stud earrings, pear stud earrings, cushion cut stud earrings, oval stud earrings, emerald step cut stud earrings, emerald radiant stud earrings, trillion stud earrings, marquise stud earrings, and heart stud earrings. 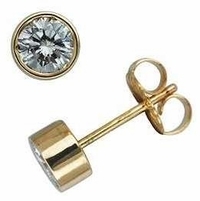 We also have a selection of bezel set studs in various shapes and carat sizes. Choose standard push posts and push backs, screw posts and screw backs as well as extra large jumbo earring backs. If you do not see the shape or size you are interested in, please feel free to contact us, via our toll free number at 1-866-942-6663 or Live Chat with one of our knowledgeable representatives.